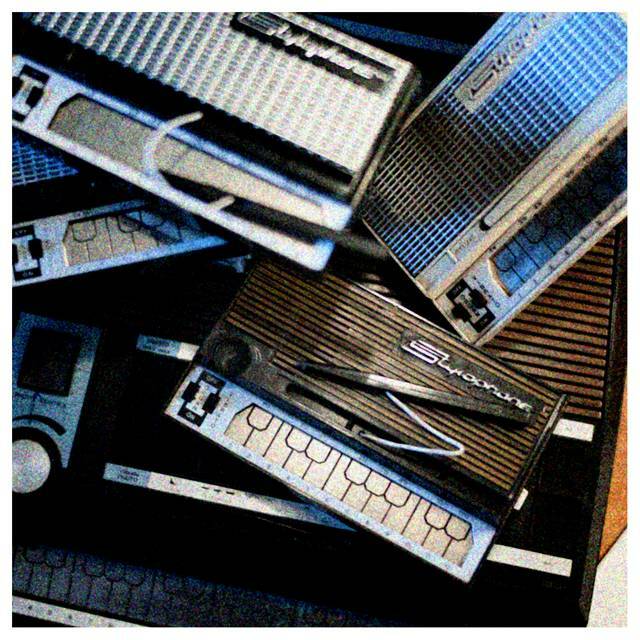 Stylophone madness rebooted as a drum machine! When we assembled all the vintage Stylophones for StyloSynth, quite a few of them turned out to be… well, less than perfect. Instead of making Stylophone noises, they buzzed, crackled, popped, squeaked, glitched and farted at us. So we recorded all of those gnarly little noises and played with them: dropped them in pitch, or looped them, timestretched them, faded them and fiddled with them until they sounded like drum hits, hats, crashes, and percussion. We even made some toms by twisting the Stylophone’s tuning knob while smacking its little contacts. 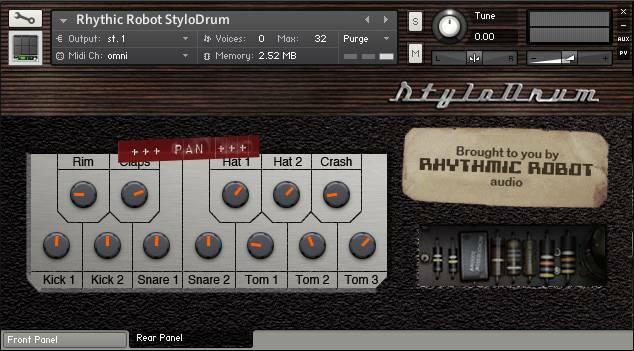 The result is StyloDrum, a happy hotchpotch of Stylophone-based madness crammed into a tiny Kontakt footprint. 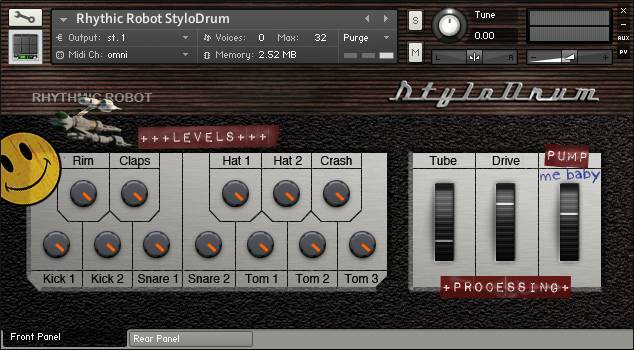 StyloDrum consists of four kits spread across four octaves, each with at least a couple of gritty kicks and snares to hold down the backbone of your beat, and most with hats and crash too. Some have toms or rim shots or claps… or perhaps some of those sounds have got left off in favour of scratches, glitches, squeals or other happy accidents that came our way while recording. It’s amazing how punchy some of these little blips and bloops sound when run through some Tube distortion, overdrive and the über-hefty Pump compressor. They’re ideal for grime and glitch-based tracks, or anywhere that you think is too squeaky clean and needs grunging up a bit. And while they may blow your cones, at £5 they shouldn’t break the bank. This may not be the beatbox to replace your treasured 808, but it does offer something a bit different, genuinely original, and thoroughly analogue. So if you’re in the mood for something from the outer limits, stick a StyloDrum in your mix today. \\\”Rhythmic Robot are a small outfit dedicated to breathing life into the strange and the obscure via the medium of Kontakt. Their instruments require the full version of Kontakt rather than the player version, and V4.2.3 or later is recommended. The samples behind each instrument are 24-bit mono, well balanced and natural sounding, and every parameter is just a right-click away from MIDI control. Also, since they\\\’re at \\\’app store\\\’ prices, it\\\’s hard not to be tempted to try one — or more than one. There are currently three main collections to sift through: Beat Room, Keyboard Vault and Laboratory. This month we start with a look at Beat Room and we\\\’ll continue our rhythmic explorations in the June issue of Sound On Sound. Lovers of old drum machines will recognise some of this batch, but there\\\’s at least one you won\\\’t have come across. Starting with the best known, Doctor 55\\\’s samples are sourced from a Boss DR55: the first Dr Rhythm. With a kit consisting of just a kick, snare, hi-hat and rimshot, the DR55\\\’s best patterns arose through creative use of accents. Understanding this, Rhythmic Robot have sampled every percussion voice at every accent level and have also provided a \\\’Velocity Retrofit\\\’ button, so you can play with nuances no genuine DR55 could match. The chink in the DR55\\\’s sonic armour was always its snare. It was just a fraction too short, at least without a spot of internal tinkering. Fortunately, Rhythmic Robot have tinkered on our behalf, and so are able to offer the original snare plus a second, boosted with variable attack and decay. With its large rotary dial delivering a selection of progressively brighter tones, the neat and recognisable UI is the perfect setting for this recreation of the oldest Dr Rhythm. Next up is the SR88, its samples taken from a Sound Master Memory Rhythm. This was an analogue beatbox from the 1980s, its most unusual feature a basic low-pass filter acting as a master tone control. Filled with samples of each drum at every available filter setting, this simple Kontakt instrument slips into a mix as effortlessly as any Roland drum machine. With \\\’Velocity Retrofit\\\’ active, dynamics are routed to tone, opening doors to surprisingly subtle and expressive patterns. As we know, analogue sounds tended to be labelled with a certain optimism, and here the SR88\\\’s \\\’crash\\\’ is of that ilk; it\\\’s actually a cute metallic plink. However, the kick is fat and meaty and, when tuned down low, could justify an SR88 purchase by itself. True, the snare suffers from the same affliction as the DR55 (it\\\’s a little \\\’premature\\\’) but, again, the Professors at RR found a way to prolong it, and to extend the duration of other voices. There are thus alternate versions of the snare and cymbal, plus two extra hi-hats, all with independent two-stage envelopes. The SR88 is a great little instrument — and a discovery for yours truly, who never owned one. Yamaha aren\\\’t a company often associated with analogue drum boxes; their MR10 didn\\\’t exactly set the world\\\’s foot tapping and was most notable for the pads that were provided to accompany the preset rhythms. In the MR11, you get all the MR10\\\’s sounds primed to play original patterns via your DAW. The MR11 has no global tune control like Yamaha\\\’s machine; instead, each voice has been sampled at different tunings. I was pleasantly surprised by how the MR11\\\’s kick and snares cut through; they\\\’re way better than my (admittedly foggy) memory suggested. Only the toms still fail to move me — they\\\’re naff and cheesy as ever — but, in compensation, drums not previously available to the user (conga, guiro and the second snare) have been liberated from their preset patterns, to be played like any other. Velocity can be switched in to drive instrument pitch, which has a disturbing effect on the otherwise cool snares, but is decidedly funky when applied to hi-hats. Another cracker. The last resident of the Beat Room that we looked at (more are being added) is the StyloDrum: a drum machine that never existed before. It was built from the pops, crackles and glitches of a hoard of Stylophones, some distinctly tetchy after years of being forced to play \\\’Amazing Grace\\\’. StyloDrum\\\’s character is anything but graceful. It brings to mind circuit-glitched nastiness, yet its percussive wonders were created not with a soldering iron but via external processing such as looping and time-stretching. There are four preset kits spread over four octaves and, although control over these is minimal, there is sufficient variation in the lo-fi thumps and howls to deliver reliably whenever you\\\’re inclined towards the dark side.